Born in 1945 in Mehsana, Gujarat; Karsan bhai Khodidas Patel is an Indian industrialist who founded a brand that has remained one of the most famous ones amongst the Indian middle-class – Nirma group! 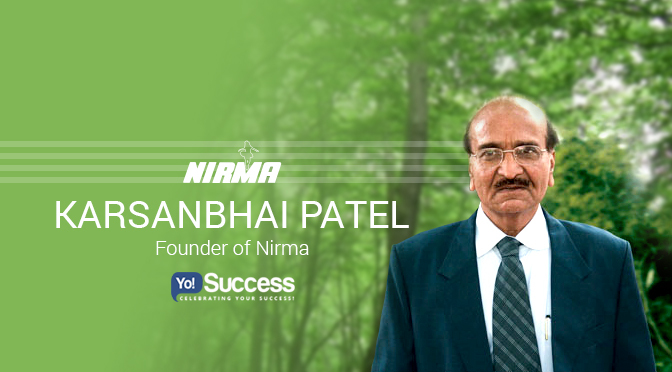 A well-known entrepreneur and philanthropist that he is; Karsan bhai started Nirma as a one-man operation and has brought to a stage where today Nirma has 18000+ employees and revenues worth more than Rs.7,000 Cr. Nirma is a group of companies Headquartered in Ahmedabad, Gujarat and deals in manufacturing of products that range from cosmetics, soaps, detergents, salt, soda ash, LAB (Linear Alkyl Benzene) to Injectables. Nirma as a company is the best example that proves that if you supply at the right price, the product itself has the potential to create its own demand. And evidently, today soaps and detergents have almost 90% penetration in India. To add to that, the group’s two brands, Nirma and Nima with 32 variants, are distributed amongst more than 2 million retail outlets, which go on to generate INR 4000 Cr ($833.30 Million) in gross sales. Presently, although Karsan bhai acts as the Chairman of the group, but the Bollywood-buff unofficially leads a retired Karsan bhai’s and his two sons and son-in-law manage the show. Rakesh K Patel (MBA) takes care of procurement and logistics, whereas Hiren K Patel (Chemical Engineer & MBA) takes care of marketing and finance and lastly, human resources and Healthcare Industry (Nirlife healthcare) is managed by Kalpesh Patel. Karsan bhai is one of the most inspiring success stories of his era and today’s times. Forbes listed Karsan bhai’s net worth as $640 million in 2005. He is also referred to as K. K. Patel by his near and dear ones. Karsan bhai was born into a family of farmers in the north of Gujarat! After completing his B.Sc. in Chemistry at age 21, he started working as a lab technician at New Cotton Mills, of Lal bhai Group and then moved on to working at Geology and Mining Department of the state Government. While at it, in 1969 Karsan bhai manufactured phosphate-free Synthetic Detergent Powder at the Gujarat Government’s Department of Mining and Geology, and started selling it locally. He sold this new yellow powder at INR 3.50 per kg, at a time when HUL’s (Hindustan Unilever) Surf was priced at INR 15. And named it Nirma; after his daughter name Nirupama (who had died in an accident). The packing and the formulation took place in a 10x10ft room in his house and Karsan bhai was easily able to sell about 15-20 packets/day while on his way to office on his bicycle, which was roughly 15kms away. With much obviousness, the product in no time gained a huge demand in Ruppur (Gujarat). He continued this protocol for the next three long years and gradually grew his customer base as well. In 1972, once he was 100% confident about his home-based venture, Karsan bhai decided to take the next leap and quit his job. Soon after that, he set up shop at small workshop in an Ahmedabad suburb. And within no time, Nirma established itself in Gujarat and Maharashtra! By 1985, Nirma washing powder had become one of the most popular, household detergents in many parts of the country. More than 18 years later; in 1990, Nirma launched their second product ‘Nirma Super Detergent’, a spray-dried blue detergent powder which was followed by the launch of their high-TFM (total fatty matter) content Nirma Beauty Soap. And with that, Nirma began an aggressive expansion of their product portfolio! Soon in 1994, the group got listed on the stock exchanges as well! By the year 1999, Nirma had become a major consumer brand which offered a wide range of detergents, soaps and personal care products. And because these were made without some phosphates, Nirma was also more environment friendly than the rest. Now that the world was moving towards advancement and better technology; to match the pace, Nirma also brought in the latest technology for its manufacturing facilities at six of their locations across India. Their success in this highly competitive soap and detergent market so far was dependent on its brand promotion efforts, which was complemented by its distribution reach and market penetration. This was also largely fuelled by housewife-friendly advertisement jingles & its motto of high quality and low price as well. As a matter of fact, Nirma’s network was a compilation of more than 400 distributors and over 2 Million retail outlets across the country. And because of such deep-rooted network, Nirma was able to reach out to the smallest of villages around. And with that, Nirma became the largest selling detergent in India, that to within just a decade. Nirma entered the premium segment and launched toilet soaps — Nirma bath and Nirma beauty soap, along with premium detergent Super Nirma detergent. And today holds a 20% market share in soap cakes and about 35% in detergents, overall. After successfully countering competition from HUL and building a solid & unbreakable market for itself in the lower-end of the detergents and toilet soap market; Nirma decided to enter the upper-end, primarily to retain its middle class consumers who would graduate to the upper end. And with that they launched toilet soaps for the premium segment! With an increased turnover by 17% to INR 12.17 Billion; by 2000, Nirma now had a 15% share in the toilet soap segment and more than 30% share in the detergent market. Nirma’s detergent did a business of 800,000 tonnes – which was one of the largest volumes sold in the world under a single brand. Also, since their production was massively dependent on labour, the company also became one of the leading employers of the country who were employing 14,000 employees. Launched the Nirma labs education project, which was aimed at training and incubating entrepreneurs! In November, 2007, Nirma acquired the American raw materials company ‘Searles Valley Minerals Inc.’ – and with that Nirma Group became one of the Top-7 Soda Ash manufacturers in the world. In 2008, due to another acquisition of massive production facilities near Ahmedabad, Nirma stepped into the field of healthcare as well with the name – ‘Nirlife’, with an aim of manufacturing and marketing intravenous fluids, lifesaving drugs, amino acids etc. Nirlife was able to achieve a grand market share of the domestic & global market and went on to become the poster child for entrepreneurship. And today, although Karsan bhai continues to hold the position of the Chairman, he leads the life of Retirement and has handed over the operation control to his younger son Hiren who acts as the Managing Director, whereas the elder brother Rakesh is the Vice-Chairman. Apart from that; Alpha Olefin Sulfonate, Sulfuric Acid, Glycerin, Single Super Phosphate, Infusions, Injectables, Critical Care Products, Medical Disposables, Salt, Cement, Single Super Phosphate, Castor Oil, Multilayer Tubes, Seamless Tubes, Tube Laminate, Labels, Flexible, Laminate, Paper & Plastic Cups, Tarpaulin, and Injection Moulding, individually produce various products. Clearly, Nirma had completely rewritten the rules of the game, in a blink of an eye – by offering good quality products at drastically low price. This was also one of the prime reasons of its success too! When majorly all overlooked this trick; Nirma aggressively used it as their marketing strategy! To keep production costs at a bare minimum, the company very innovatively undertook captive production plants for their raw materials. And with that started their backward integration programme! Under this programme, two high-tech plants were established at Baroda and Bhavnagar, which went live in 2000. And a drastic fall in the cost for raw-materials was seen. And unlike the point-of-view of the critics; these plants went on to stay ahead of their given schedule and that too at a much lower cost than estimated. With a staffing of as low as 500; these plants managed to stay ahead of Tata’s Chemical plant, which was about twice the capacity and employed 10 times the number of people! Now a major problem arrived when Nirma started to grow and their salesmen started to directly approach the retailers, who till then used to work with multinational brands. The problem was that these retailers were habituated to taking the stock on long credits and as a special favour. And as & when their salesmen went to ask for the payment, he was either shown the door, offered a part payment (even when the material was sold), or the material was given back. This indeed was becoming a real pain for the company! And huge accumulated credit in the market was making it difficult for Nirma to operate. This is when Karsan bhai took the control in his hands and called in a meeting of the entire team one day. He took a very risky and a drastic step in that meeting. India was changing at that time, and he clearly knew the power of advertising and promotions. Hence, in the meeting; he at first, asked the team members to go out and collect either the money or material in full. Obviously, this shocked the retailers as well as their competitors and market was without Nirma. These ads immensely raised the consumer demands, but obviously Nirma was nowhere to be found in the market! When the demands reached its peak, the Retailers started to look for Nirma. And this was exactly what Karsan bhai was waiting for. Karsan bhai called for another meeting of his team, Delivery vans were cleaned, Material was loaded and NIRMA hit the market again. But on once simple condition: All cash on delivery, No Credits! This changed the outlook of the brand – Overnight, without any damages and gave a fantastic fight back to the leading global brands. Their catchy ad campaign along with their catchy jingly has since then continued to echo in the drawing rooms of middle-class Indian homes through the decades. This jingle, which was first aired on radio in 1975, was broadcast on television in 1982 and since then is one of the longest running jingles. Such is their confidence that; even today every packet of Nirma that Karsanbhai Patel sells to his consumers comes with a money-back guarantee. Nothing has changed! Purchased an INR 40 crores six-seater chopper (2013) and become the third Ahmedabad-based industrialist to do so.